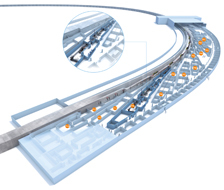 Layout of the installations inside the PETRA III experimental hall “Max von Laue” including the ring tunnel, the optics and experiment hutches as well as control cabins. 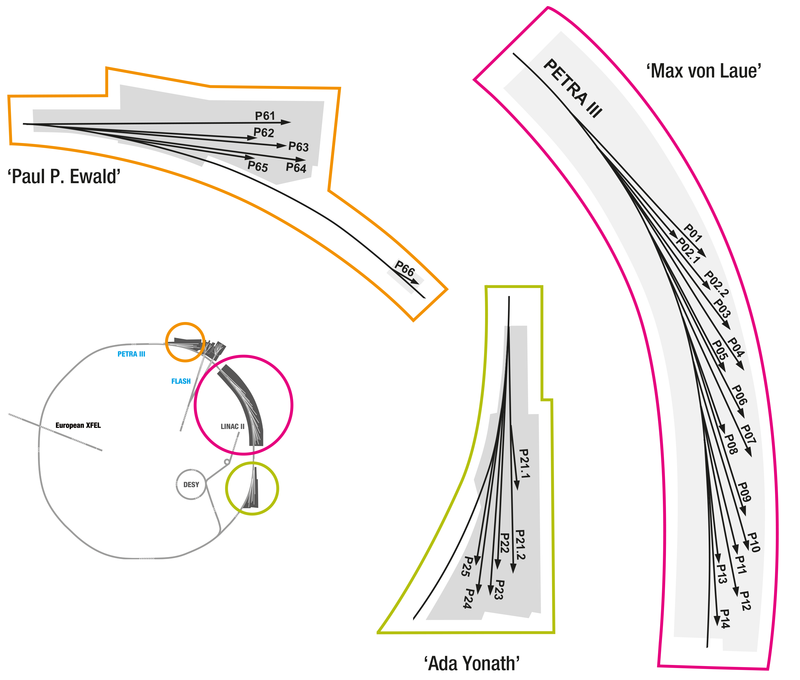 PETRA III experimental halls: 'Paul P. Ewald' (orange), 'Max v. Laue' (pink) and 'Ada Yonath' (green). P01 specialises in Nuclear Resonant Scattering (NRS) and Inelastic X-ray scattering (IXS and RIXS) experiments at photon energies between 2.5 keV and 80 keV. The beamline offers high energy resolution in the range from 1 meV to about 1 eV and high spatial resolution in the (sub-)micron regime. P02.1 provides high-resolution powder X-ray diffraction in the hard X-ray regime, with a fixed energy of 60 keV, making it particularly useful for high Z materials. The high-energy also allows total scattering data to be collected (typical QMax = 20 Å-1) for Pair Distribution Function Analysis. A range of sample environments for non-ambient (e.g. variable temperature measurements) are available. P02.2 is specialised in micro diffraction experiments on single crystals, powders and non-crystalline materials performed at extreme conditions of high pressure and simultaneous high- or low-temperature (e.g. in the Diamond Anvil Cells) with an emphasis on time-resolved measurements. The beamline operates at 25.6, 42.7 or 60 keV. P03 offers small- and wide-angle X-ray scattering (SAXS/WAXS). Exploiting the low emittance of the PETRA III source, P03 provides micro- and nanofocussed X-ray beams with energies in the range 9-23 keV. P04 allows a wide range of experiments with soft X-rays in the fields of gas phase physics, magnetic spectroscopy, high-resolution photoelectron spectroscopy, surface chemistry, soft X-ray diffraction and holography. The beamline provides exceptionally high photon fluxes (1012 ph. s-1) in the soft X-ray regime, over an energy range from 250-3000 eV. P05 is dedicated to micro- and nanotomography at energies between 5 keV and 50 keV. Sample sizes which may be studies at the beamline range from 100µm up to 10 mm. Phase contrast imaging methods including inline phase contrast and grating based phase contrast are available as well as regular absorption contrast imaging. P06 offers visualisation with micro- or nanoscopic spatial resolution using a range of X-ray techniques such as X-ray fluorescence (XRF), X-ray absorption spectroscopy (XAS) and X-ray diffraction (XRD), over the energy range 5-21 keV. Coherent diffraction imaging applying ptychographic scanning schemes enables X-ray microscopy with increased spatial resolution down to the low nanometer range. P07 offers high-energy X-ray diffraction (XRD) and imaging techniques with tunable X-ray energies in the range of 30 to 200 keV. 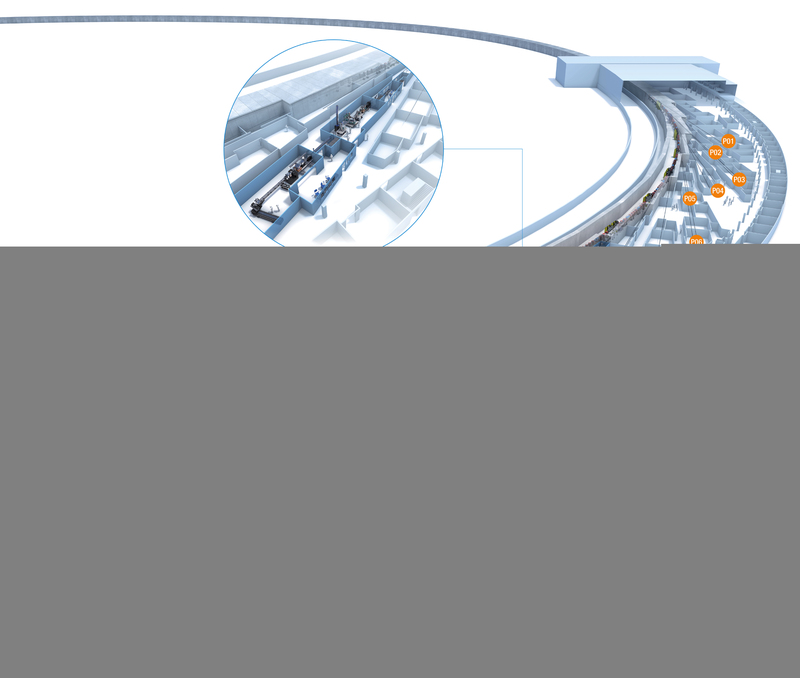 Micrometer focussing is also possible with Compound Refractive Lenses (CRLs). Experiments aim to investigate relationships between macroscopic and micro-structural properties of polycrystalline materials, grain-grain-interactions, recrystallisation processes, the development of new & smart materials or processes and in situ catalysis mechanisms. P08 is designed for diffraction and scattering studies on condensed matter samples, with high-resolution in both real- and reciprocal-spaces. The beamline performs a mix of diffraction, small angle scattering and reflectometry experiments with energies in the range 5.4 to 29.4 keV and beam sizes from 1.5 x 1.0 mm down to focussed beams of 30 x 2 µm. P09 is designed to operate in the hard X-ray regime with energies ranging from 2.7 to 50 keV. The beamline consists of three experimental hutches. The first two experimental hutches, EH1 and EH2, are dedicated to resonant X-ray scattering and general diffraction (RSD) as well as XMCD experiments. P10 serves three main experimental goals: investigation of sample dynamics in the range from microseconds to seconds by X-ray Photon Correlation Spectroscopy (XPCS); coherent diffractive imaging of micro- and nanostructures (CDI); and time-resolved small angle X-ray spectroscopy (SAXS) studies of complex liquids (Rheo-SAXS). The beamline operates in the medium-hard X-ray regime (5-25keV). P11 specialises in to imaging and diffraction experiments of biological samples and microcrystals, through the use of micro- and nanobeam applications. The beamline consists of two end stations: the first is a diffraction experiment operating between 5.5 and 30 keV; and the second is an X-ray microscope (currently under construction) operating in the soft X-ray regime (2.4-10 keV). P12 is optimised for low background data collection for biological small angle scattering (BioSAXS) experiments on macromolecular solutions or kinetics experiments with high temporal resolution. Fully automated and remote data acquisition and processing are available using the robotic sample changer and the Beamline Meta Server software. P13 is a macromolecular crystallography beamline for single crystal biomolecule structure determination and fluorescence measurements, operated by EMBL Hamburg. The beamline operates at 4.5 to 17.5 keV with both micro-beam (30x20 µm beamsize) and unfocused beam (with a maximum size of 105 µm) for larger crystals. 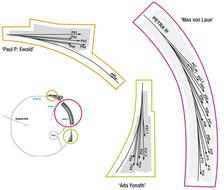 P14 is a macromolecular crystallography beamline for single crystal biomolecule structure determination and fluorescence measurements, operated by EMBL Hamburg. The beamline operates at 6 to 20 keV with both micro-beam (5x5 µm beamsize) and unfocused beam (with a maximum size of 200 µm) for larger crystals. The beamline is dedicated to HAXPES applications (2.4 to ~15 keV) with variable energy resolution and photon polarization. It provides specialized and worldwide unique instruments. The main HAXPES setup employs an electron analyzer with an optional 2D spin filter detector. A separate HAXPEEM instrument allows for spectro-microscopy applications in the keV regime. In addition, an ambient pressure HAXPES system for in-operando studies at local pressures beyond 1 bar will be available. P23 is designed for X-ray reflectivity, resonant X-ray scattering, grazing incidence diffraction, X-ray standing waves. Other techniques such as powder diffraction, SAXS/GISAXS, XANES and coherent X-ray diffraction are also available with some restrictions. It provides a 5+2 circle diffractometer for sample cells up to 150 kg (horizontal scattering) and up to 15 kg on an Eulerian cradle (vertical mode). Data can be collected in the range 5 keV to 35 keV, up to 50 keV with limited focusing. P24 is designed for a range of experiments on single crystalline samples under ambient or non-ambient conditions including classical crystal structure studies, diffuse scattering studies and charge density analysis, as well as studies of phase transitions, disordered and modulated structures.There are two experiment hutches: EH1 equipped with a Kappa diffractometer and EH2 with an Eulerian diffractometer. Data can be collected at 8 keV or in the range 17 to 44 keV. P64 is dedicated to X-ray absorption spectroscopy experiments requiring high photon fluxes. Among those are quick EXAFS (QEXAFS) on the 20-100ms time-scale, EXAFS of highly-diluted systems, and high-resolution spectroscopy with a dispersive fluorescence spectrometer in von-Hamos geometry. Typical applications include studies of mixed-valence compounds, catalysis or local environment of active metallic center in biological molecules. P65 is designed for classical EXAFS applications, providing an unfocused undulator beam (0.5x1 mm2) which is ideally suited for in situ investigations of catalysts, batteries etc., but also for all kinds of samples with sizes larger than 1 mm2. Applications include basic physics, material sciences, biology, environmental sciences and geochemistry. Diluted or in-transparent samples can be measured in fluorescence yield XAFS mode.